Dr. Gary Chin was born and raised in Northern California near Sacramento. He graduated from college at University of the Pacific, Stockton, CA with a B.S. in Chemistry-Biology. He studied at the Professional school in San Francisco, CA, University of the Pacific School of Dentistry. Dr. Chin has been in practice for over 28 years and has experience in all areas of general and cosmetic dentistry. He currently performs procedures such as extractions, root canal treatment therapies, composite fillings, dentures, partial dentures, implant crown restorations, Invisalign orthodontics, full mouth reconstruction and periodontal services such as deep cleanings, bone grafts, and gum grafts. Dr. Chin has been married for 28 years and during his spare time, he enjoys fishing, gardening, hiking, painting, sculpturing and playing musical instruments. He is also a member of Bible Baptist Church in Everett. 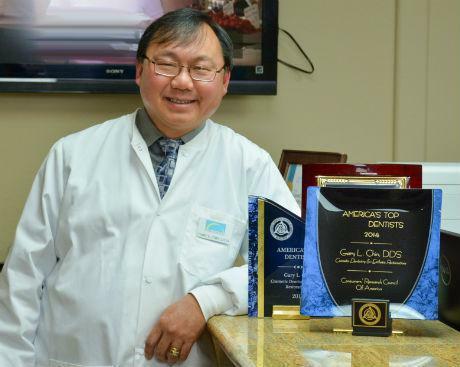 Dr. Chin has received special recognitions with America's Top Dentist 2005-2006 and 2009-2010 in Cosmetic dentistry and Esthetic Restoration. We feel very fortunate to have Dr. Chin at our Everett location as our Primary Care Dentist providing the best quality care for our patients.